Tours in tricycles with drivers traveling through Barcelona with passengers on board. Choose your preferred route! We also organize events for groups, stag parties, weddings, etc. 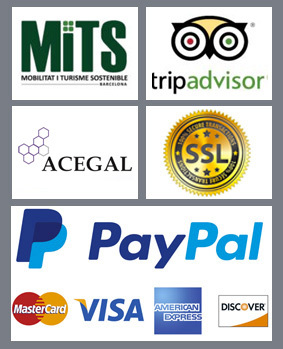 You can make your reservation in advance from anywhere in the world, through our website. The Trixis also operate in many cities in Germany as well as in Europe (Amsterdam, London, Copenhagen) and worldwide (Tokyo, Kyoto, Beirut, Rijad). We have been the first and only to launch them in Barcelona more than 17 years ago. TRIXI is equipped with an electric motor that helps the Trixist when pedaling. 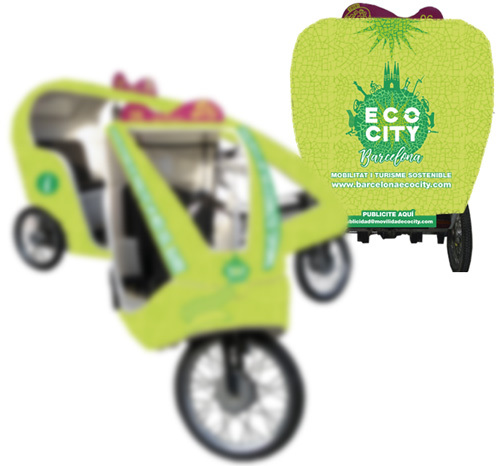 It is a fun, ecological and quiet mode of transportation. On board of our vehicles, you can also buy the whole offer of tourist product available in Barcelona at an official price and with exclusive benefits, such as skipping the queues. On board of all our vehicles the payment of credit card or debit card is accepted. Our policy of transparent prices allows us to provide security to passengers, informing through all our channels the rates established for the Taxi-Tour service in Trixi. Online reservations have a surcharge of 10€ on the price of the hour, in terms of management fees and organization of the tour/event. Do you want a ride in Trixi? Book Online your next Tour! With our online reservation system, you can anticipate and confirm your reservation from anywhere in the world, including events and groups.